I am happy there is a movement to change the way we approach coaching basketball. It is a small movement but it is gradually gaining steam. The fascinating thing for me to watch over the last few years is how much analytics and human performance physiology has modified how we coach basketball. The surprising thing is that when it comes to research-based facts the same evolution has not changed how most coaches run their practices. These research-based concepts are not new. I learned about the value of random/variable practice twenty years ago during my undergraduate studies in Kinesiology. My learning continued and gained momentum when I learned about the work of Joan Vickers who created a concept called Decision Training (Read More: Decision training: an innovative approach to coaching). Later I learned more about the use of decision cues when I visited Italy and spent time with Massimo Antonelli (an Italian skills coach that uses music and specifically beats per minute to improve performance). Ever since I learned these concepts I have used and experimented with the idea of how to make my practices more game-like. My practices initially consisted of drills. That was how I was taught. That was how all the coaches I learned from as an assistant, and at coaching clinics, taught the game. My goal with these drills was to make them as random and variable as possible. In other words to avoid blocked practice. As my coaching education continued I started to realize the most effective way to accomplish many of the concepts outlined in Decision Training was to simply practice 4-on-4 and 5-on-5 as much as possible. It made my practices random because we were playing the game. It also allowed us to work on offense and defense at the same time within the context of the game. Very little is scripted in our practices beyond the initial situation we are working on. For example we may start the 4-on-4 by having the offense run a high ballscreen. This means we are focusing on high ballscreen offensive and defensive decision making and skill development. Beyond that initial sequence however whatever happens is live, just like in a game. We usually play multiple trips to further simulate offensive and defensive transitions. During these trips sometimes we ask our players to execute certain options. For example if the offense cannot get an early primary attack they need to flow into a wing ballscreen or possibly an offensive action depending what we were trying to improve. Similarly the defense is asked to make decisions live based on what is happening. We can flow into certain coverages based on match-ups or game situations. Since then almost 90% of our practices are what I would call a Games Approach to Coaching Basketball (Read More: Game Sense to Coaching Basketball). We do not just roll out the balls and play. We stop our practice games to use our coaching interventions to praise, correct and improve. If our players are doing something wrong or we are curious about a decision they made then we stop the practice game to coach. Here are the coaching interventions we use within our games approach to coaching basketball. We use these words to coach our players. A foul means there was a mistake that we need to correct. Recreate means we are going to go back create a situation again to teach; this gives our players a context for what we are trying to improve. Remind means we are going to remind our players about a concept we have coached already that they are not executing. Demo involves us demonstrating a concept within the game to help our players see what they are doing well or what they need to improve. We want to use questions to stimulate thinking. Thinking is driven by questions, not by answers. Answers represent an end to thinking. The proper questions develop our players’ thinking processes. They tell you that your players can understand and are thinking about what you say. The only way we know that our players are thinking is if they are talking. Questions get your players thinking and talking which leads to better understanding. This answers the question of how to practice using a games approach. The next challenge became, how I can better train my players individually? Ideas from many sport researchers and coaches from different sports have led to what I call BDT (Basketball Decision Training). 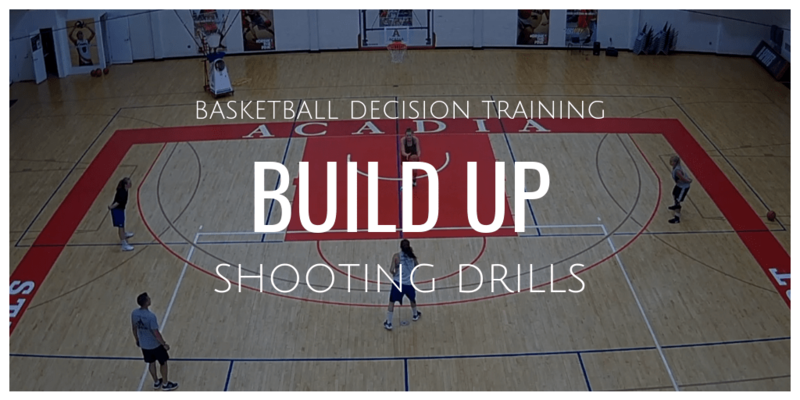 The goal of BDT is to provide learning opportunities that help players to improve their decision-making skills, not just their technical skills. It uses random and variable learning opportunities to best simulate competitive conditions. The foundation of the BDT process is the hand and body signals which key an offensive reaction. Various signals are used by the passer/coach and the offensive player must read the signals to make the appropriate decision. This interaction makes the passer/coach an active participant in the learning process. Rather than mindlessly passing, the passer/coach is mixing their signals to try and make the shooter make a mistake. It is their goal to “screw up” the shooter. Since we learn through struggle, we want each sequence to be random. The shooter has no idea what the signals are going to be as we want to create optimal challenge for them to learn how to make quick decisions based on the decision making cues they see. There are many layers we can add to BDT to make it more challenging for the shooter. So once they have developed competency at one layer, other layers can be added. For example we can start BDT on the spot with two players. To increase the challenge we can add another passer/coach, we can have the shooter relocate after each pass, or we can add game-like actions to start the sequence. BDT can be applied to just about any drill. Each decision cue leads to an offensive reaction by the shooter. These reactions simulate game decisions. My point with this blog is that there is a researched back way of coaching that can help you improve the quality and effectiveness of your practices. Many of the teaching methods used by coaches are not as effective at accomplishing the goal of transferring training to game peformance. Numerous researchers and studies have consistently concluded that random practice makes players better over the long term and prepares players more effectively to perform in competition. Why? Because the opposite of random practice is blocked practice. Blocked practice involves athletes repeatedly performing a skill again and again. For example, ten shots in a row from the elbow. On the first few repetitions the shooter may have to think, but after that the drill becomes mindless. Whereas in random practice a shooter would be required to think on each repetition. This process of engaging the mind of the learner on each repetition leads to better retention. Blocked practice has a low level of transfer to actual performance of a skill. Even though performance looks good initially with blocked practice, it is not good for performance in the context of a skill. Employ several aspects of technique within a session. Learning is best when one performs the skill in a variety of ways and/or contexts rather than one way and/or one context. Random practice increases the capacity to perform the skill in a future game situation. Blocked practice may be best (perhaps it may even be the only choice) during the initial learning to produce the action successfully. After initial learning, it is best to use random practice. There is a significant challenge in using BDT and a games approach to coaching. It is a difficult sell to players, parents and administrators who are used to practices looking and feeling a certain way. Players are often frustrated when using random practice because many mistakes are made and learning seems slow so your practices won’t look as good. Coaches should inform players, parents and administrators that random practice is useful because of the high transfer and that they will be able to perform a skill better in the long run. In all my Zero Seconds BDT camps for Breakthrough Basketball I give a disclaimer to the parents and players. I tell them everything we do is intentional. It is by design that some of our training will look chaotic and unorganized (Read More via @train_ugly Training Ugly: Great Practice isn’t Made for YouTube). I also tell them that after the first day some of the players may not like the training. This is because they are used to success. Using decision training and challenge in my coaching requires players to make mistakes and struggle. Some are not comfortable with that. The same thing will come from using a games approach and BDT in a practice. Remind them the process will lead to better retention and a freer performance. By the end of the three-day camp players who didn’t like the camp after the first day end up loving it because they improved and were challenged.